DETROIT — James McCann hit a drive to left field and paused ever so slightly — not enough to cause any sort of incident, but enough to make it clear he realized how well he’d connected. 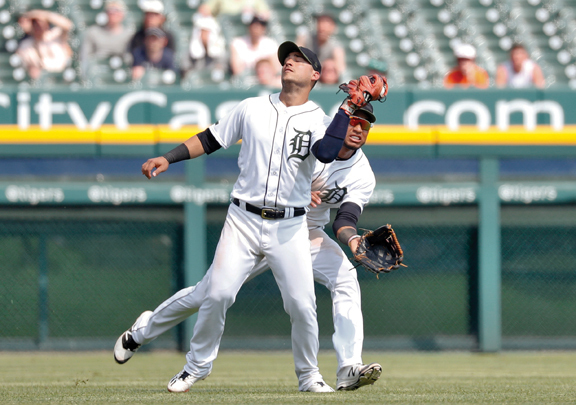 McCann’s grand slam in the third inning lifted the Tigers to a 9-3 victory over the Los Angeles Angels on Monday. Matthew Boyd pitched impressively into the sixth inning for Detroit, and although Mike Trout hit his major league-leading 18th homer for the Angels in the ninth, by then the Tigers had the game in hand. Boyd (3-4) allowed two hits in five-plus innings. His first scoreless outing of the season came on a hot day in which Detroit outfielder Niko Goodrum had to leave the game because of heat exhaustion. The temperature was around 90 degrees when Goodrum was removed for a defensive replacement in the fourth. Before leaving, Goodrum made a contribution. He beat out an infield hit in the second and went to third on a single by John Hicks. JaCoby Jones grounded into a double play, but the run came home to put the Tigers up 1-0. McCann broke the game open an inning later with a drive to left for his third career grand slam. Leonys Martin added a solo homer in the seventh, and Victor Reyes made it 7-0 with a triple later that inning — his first career RBI. Boyd walked three and struck out four. Albert Pujols hit an RBI double in the eighth for the Angels and scored on a double by Andrelton Simmons. Trout’s solo shot came with two outs in the ninth. Angels catcher Martin Maldonado and Scioscia were both ejected in the seventh after Maldonado was called out on strikes. Scioscia said two-way star Shohei Ohtani is “penciled in” to pitch Wednesday night at Detroit, but there’s still some uncertainty. “We will let you know (today),” Scioscia said.